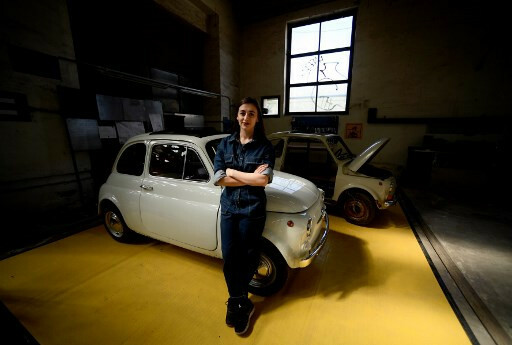 At 23, Giovanna Parascandolo is less than half the age of the Fiat 500 she has just completely restored, thanks simply to books and what she calls "1990s-style" Internet forums. "I picked up the passion by chance," the Italian architect told AFP, recounting how she got into a friend's Fiat 500 and fell in love "with the minimalist dashboard, the buttons, the switches". The classic Fiat 500 is today much sought after, and Parascandolo sold her motorbike to buy a decrepit 1967 model for 2,000 euros ($2,250). "It was completely rusted, didn't start, didn't brake," she said in the vast warehouse where she has installed "Nanna's Garage" and now works on her second Fiat 500. "I took the motor to my bedroom... and when I had a moment I took it apart and restored it," she said. She spent a year on Internet forums and reading books about how to restore the car. She only asked a retired professional for help with the bodywork. "Cutting up the rusted parts, welding... without someone to teach me, I couldn't do it," she said. She now plans to become a bodywork apprentice to learn the necessary skills for her second car. "I love taking them apart, understanding them, restoring them," Parascandolo says. "The Fiat 500 was my first love, the perfect car to learn on, the height of simplicity but I do want to move onto bigger, more expensive cars."